In the following sections you will find the resources necessary for 3DX Arduino Level 1 class. There will be an outline, list of links, related files, and how-to videos for each weekly class. 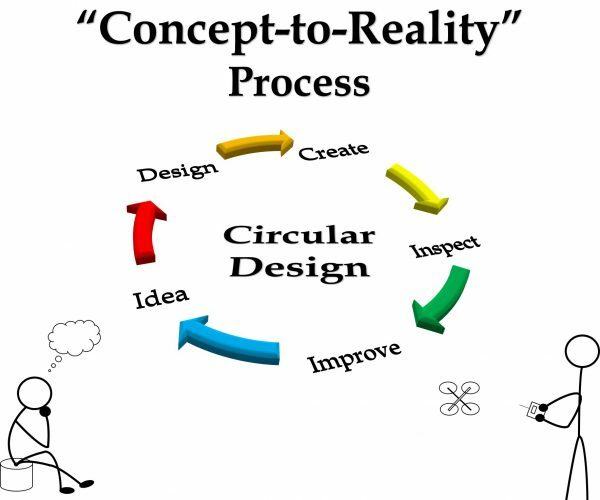 Students will use the “Concept-to-Reality” process to rapidly create their projects each week. In the 1st week of 3DX students will assemble their 3D Literacy® Learning Stations and become familiar with the 3D printing process. They will be introduced to open source 3D printing resources including Slic3r, Thingiverse, and 3D Programming resources including Arduino. The goal is for the students to build their first 3DX project, the 3D printed post with 2 flashing LEDs. In the 2nd week of 3DX students will be introduced to 3D CAD Design software and learn how to design a simple traffic light. We will also learn soldering skills and practice soldering wires and LEDs. Then students will assemble a 3-7 LED traffic light circuit and alter their “2 LED Post” programs to reflect the functions of a typical traffic light. The 3rd week of 3DX is going to be a continuation of the design and electrical skills introduced last week with two minor additions in this next project. Students will be introduced to Autodesk Meshmixer and taught how to mesh multiple STL files together for extended possibilities in their creative 3D CAD design. We will also be adding a toggle switch as an input to control a double LED light system. Students will use 3D CAD Design software to design multiple housings to be 3D printed for this project, one bracket for the toggle switch and a separate bracket with a creative file added for the LED lights. The 4th week of 3DX will be focused more on fine tuning your electrical skills and introducing more complicated programming applications including Analog Inputs, Arrays, and viewing real-time data through the Serial Monitor. Students will be designing and building a LED Bar Graph controlled with a Potentiometer. It will be up to the students to come up with their own designs for both the LED (minimum of 5 LEDs) and Potentiometer brackets and 3D print them. Week 5 of 3DX is now going to apply the programming functions from week 4 into learning how to precisely control the movement of a servo motor with a potentiometer. Students again will design, 3D print, and assemble their own servo motor project. Week 6 of 3DX students will begin working on their Personal Project, the final project in 3DX Arduino Level 1. For the 3DX Personal Projects, students will be using the “Concept-to-Reality” Project Check List to help thoroughly complete the necessary steps for the project. We will also be using this class period to catch up on any previous projects and check off appropriate boxes in the 3D Literacy® Certification Rubric. During week 7 in 3DX students will explore the amazing world of neoPixels (RGB LEDs). We will look at and a variety of programmings that create various light patterns and discuss how they work. Students will then create a 3DX project with their neoPixel strips including 3D design, 3D print, 3D programming, Assembly/test, present, and publish their own neoPixel project. Students will be encouraged to utilize creative CAD skills with the display of their neoPixels. An input for the project is encouraged but not required. tag: “3DX”, “3D Literacy Learning Station”, “3DLS”, etc. Week 8 in 3DX marks a significant milestone as we will be using an LCD screen to monitor real-time data from different inputs. We will use a tutorial on how to wire and program an LCD screen and learn how to use LCD screen to display information. Students will be required to design their project using a minimum of 3 parts that will be assembled with the supplied M3 and M4 hardware. This will help accelerate student’s spacial skills and force them to think about the entirety of the project in the design phase. When completed, this project will be able to monitor real-time data about the status of different inputs. tag: “3DX”, “3D Literacy Learning Station”, “3DX MEGA”, “Arduino”, “LCD”, and anything else included in your project that would help someone else find it when searching. In week 9 students will be learn about PIR sensors and build a motion sensing alarm system that displays system status to an LCD screen. We will use a tutorial on how to wire and program the PIR sensor and then add code to display status messages on the LCD screen. Then, the students must figure out how to add an LED, piezo buzzer, or neoPixels to the alarm for an enhanced alerting effect. Students will be required to design their project and 3D print all of the parts necessary to house the alarm system. This exercise builds a basic understanding of how SMART homes will use digital surveillance of a 3D area with the programmed intelligence to make decisions based on sensor inputs. In week 10 students will be using their PIR sensors to control a servo motor, thus creating an automated, motorized system. Students will also utilize an LCD to display system status. Students can use tutorials for PIR, servo, LCD projects from previous weeks and then learn how to combine them into a single program. Make sure to get the programming and electrical figured out. The major goal is to have the PIR sensor either open or close a door. Students will be encouraged to use a lot of creativity in the overall design of their project. There will be multiple parts both stationary and moving. Design 3D print all of the parts necessary, 3D print, assemble together and test your design. Week 11 marks the last full class period allocated towards working on final projects. The last day of class, Week 12, students will be presenting their final projects to the class. Instructors will individually meet with all students and assist with their projects. Design 3D print all of the parts necessary, 3D print, assemble together and test your designs. It is time to wrap up the semester and finish all remaining projects. The major goal in Week 11 is to have all students finish their final projects and have their notes ready for their presentations in Week 12.